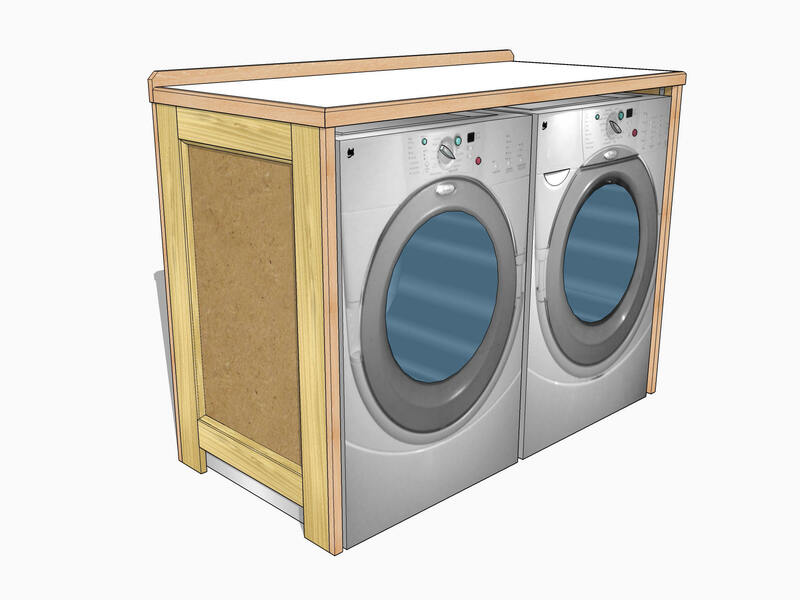 A quick project – a utility table to fit around a washer and dryer. I am not good at multi-tasking. I prefer to do one task at a time and move on. This is supremely true when it comes to woodworking. 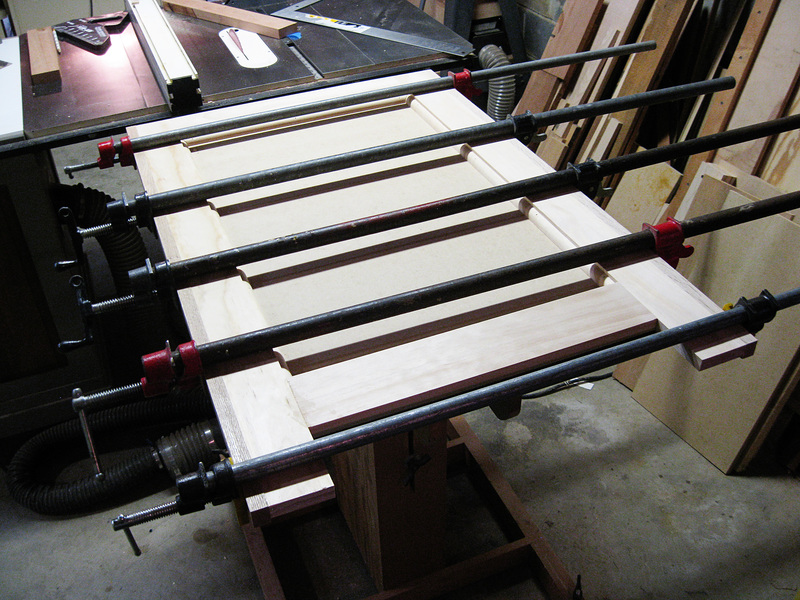 For example, I decided to break my tool cabinet and surround project into segments with stopping points so I could tackle other pressing projects should they arise. There is nothing more compelling to catapult a potential project to “pressing” status than when my wife and daughter both want me to make something. Now, there is another pressing project on their collective to-do list for me: a washer/dryer table for my daughter’s new apartment. Since my daughter’s new bookcase is only about half-finished, I am temporarly interrupting building it so I can knock out this new project. That is the plan: quick and easy. This project has been designed with ultra quick construction in mind. The table itself could not be more simple. 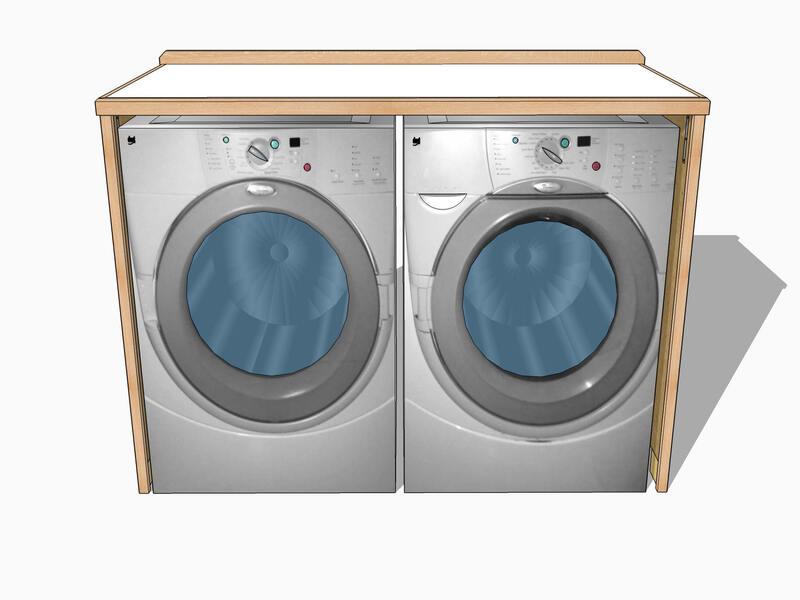 It is designed to simply slide in place, hugging a front loading washer and dryer. 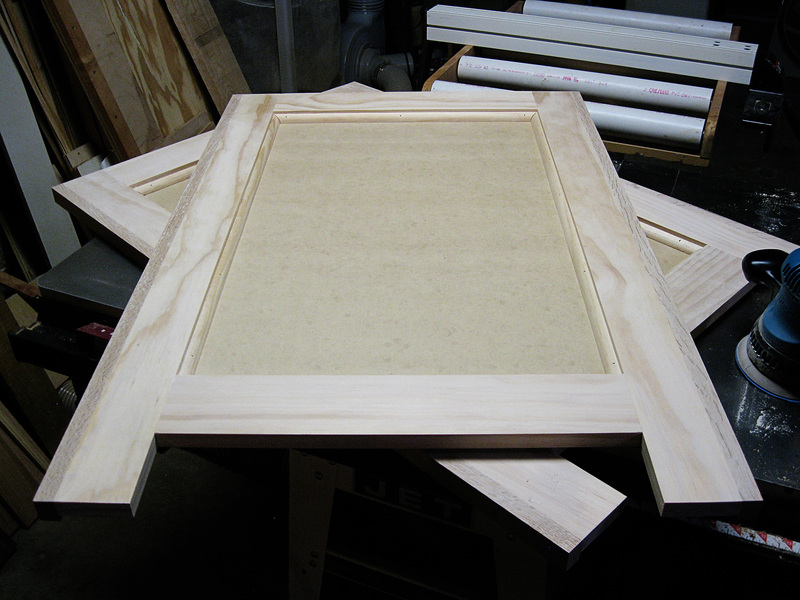 For the sides, I’m using home center clear pine, 1/4″ MDF and pine quarter round molding. Also, I am adding a thin strip of red oak at the edges to give the table a little more resistance to bumps and dings. I think the pine at my local home center could dent if I just looked at it real hard. The top will be made from a hollow core door banded with red oak for durability and the top and sides will be joined together with L-brackets and screws. Super easy; down and dirty. My wife has told me repeatedly that she does not want this project to take long and I am in a mood to make her happy. 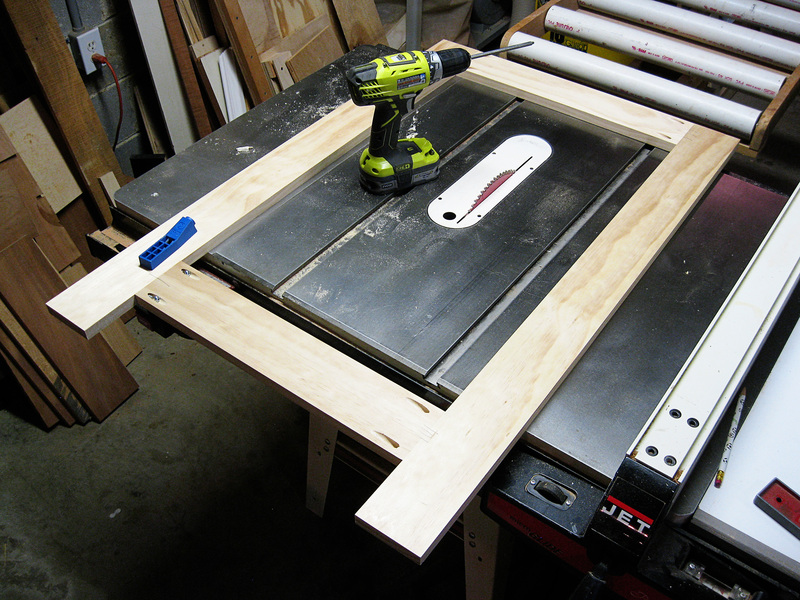 Using my miter saw station to break down long pine boards. 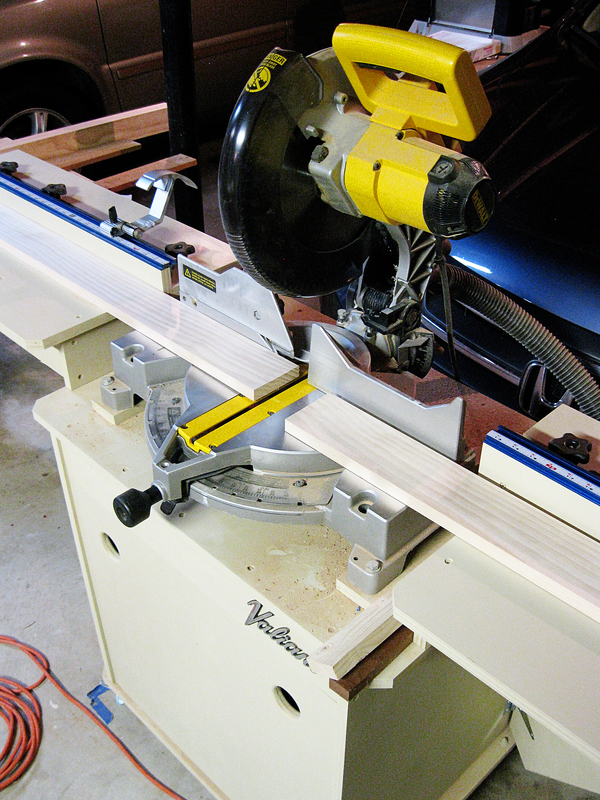 With my daughter’s window seat bookcase taking up almost all the space on my workbench, I am relegated to using my table saw, router table and roller stand as work surfaces – a perfect example of why I need a second workbench. Pine boards being joined with pocket screws. 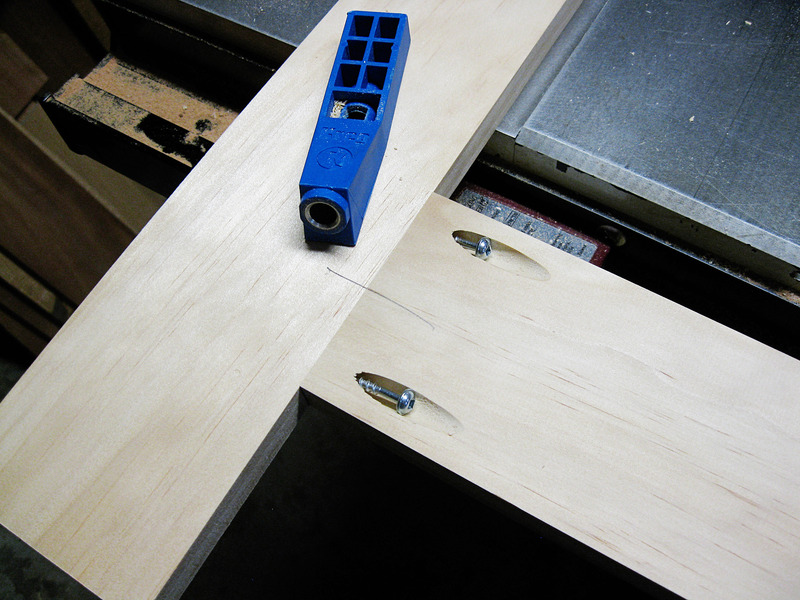 Pocket screws; the easiest joinery method. MDF added to the frame and oak banding being glued to the vertical side edges. The glued and pocket screwed rails/stiles on the sides are backed up with a glued-on sheet of 1/4″ MDF to make the sides rigid. Smoothing the oak trim flush with the pine. With the sides completed, it is time to move on to the table top. 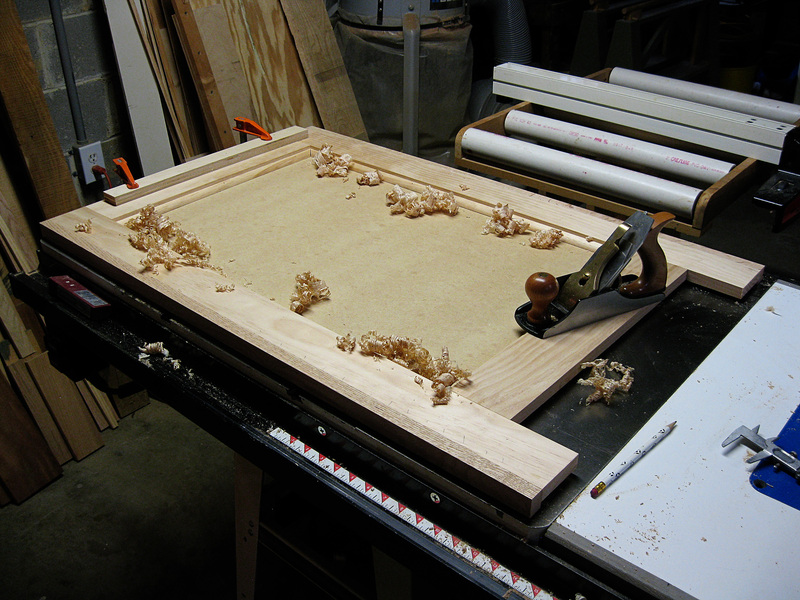 I have already purchased the hollow core door and have begun cutting it down to size. The hollow core door is a gamble. I was pulling some 3/4″ birch plywood from the stack at Lowes and just could not use it due to how heavy it would be. The hollow core door is inexpensive (as it should be) and lightweight which is very important. But, I am not sure if the hollow core door is going to be durable enough. We’ll see. More on the top next week. Jeff, if you are concerned about weight, alternately you could build a frame with 1×2 hardwood and wrap it with 1/4″ ply with the same oak trim? Would be much lighter than using MDF core or 3/4″ ply. Why does the weight matter? Once in place…I’d imagine it will stay there a while. you have the best ideas! Thanks for sharing. I want to do wood working and have many tools but the time to really get into a project eludes me! Rick, I would like to very much encourage you to find time. I will sometimes take just 30 minutes after dinner or like this morning, took about 20 minutes before work to put a coat of paint on the washer/dryer table top. But I know that even finding 30 minutes is difficult for some people. Find a small project to work on first and then graduate to bigger ones. Small projects are better for brief periods of time.